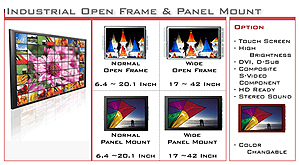 Open-frame TFT-LCD display is caseless monitors for specialized mounting applications. Screen sizes from 6.4-inch to 42-inch . Optional touch screen, TV, DVI, Video, Speaker. Panel Mount TFT-LCD display is designed to be front-mounted and secured from the rear. Screens sizes from 6.4-inch to 42-inch with black bezel(nomal). Available color change, Optiona touch screen, DVI, Video, stereo speaker. High Brigheness TFT-LCD display is 800 ~ 1300cd in Brightness.. Screen sizes from 6.4-inch to 32-inch open frame, panel mount, panel only. 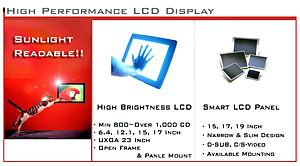 Smart Slim Panel TFT-LCD display is designed to be compact. and Screen size 10.4-inch to 42-inch . 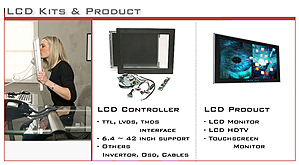 Smart Slim Panel include custom controller board and a custom sized TFT-LCD Panel.